Waterside Family Fun is steps to Spring Lake and a two block walk to the ocean. Use the home's many boats, or check out Rockaway Beach's Twin Rocks and explore seven miles of sand to sink your toes into! A spacious floor plan allows two families to vacation together, or you can bring the grandparents along! This beautiful home has three bedrooms, three and a half baths, and can accommodate up to eight guests! With upscale amenities and furnishings, this vacation home has all you need to enjoy an extended vacation or a simple weekend break from the city. 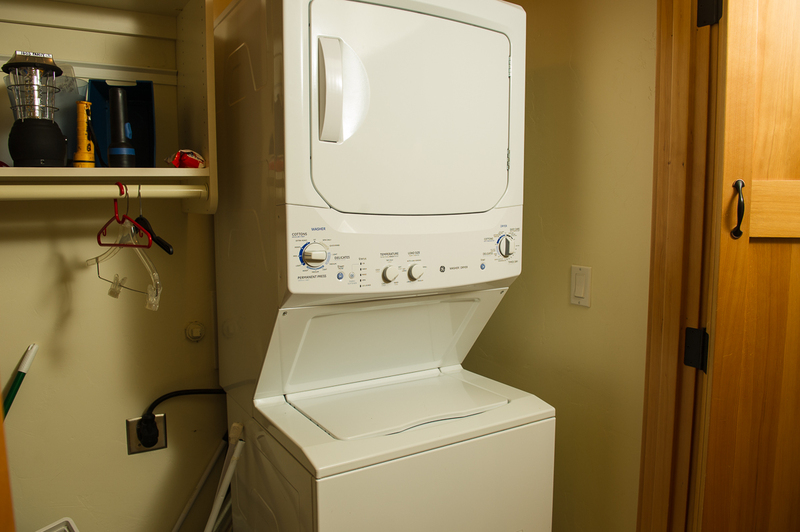 The main level of the home is where the kitchen, great room, master suite and laundry room can all be found. Granite counters and stainless steel appliances grace the well appointed kitchen. Seating for six is available at the main dining table and four stools are available for extra seating at the bar. A kid's high chair is also available for guest use. 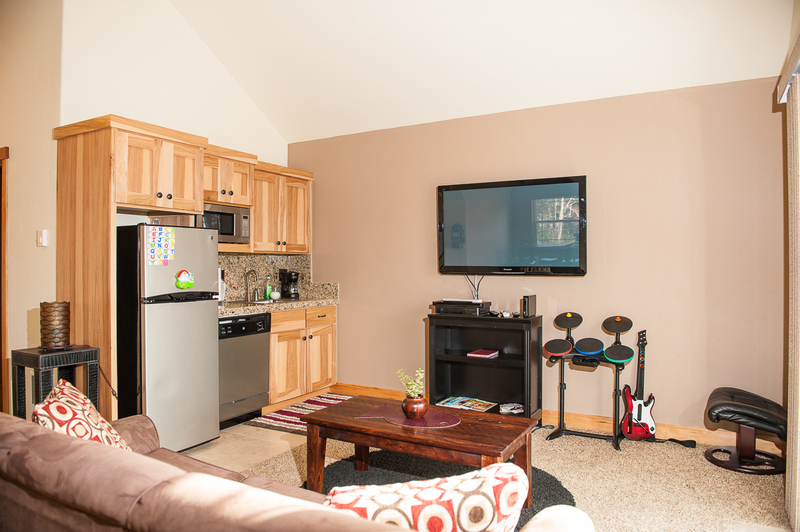 The living room has comfortable seating, a large flat panel TV and an electric fireplace. The outdoor living space on a private, fully fenced backyard patio is perfect for those warm summer nights. 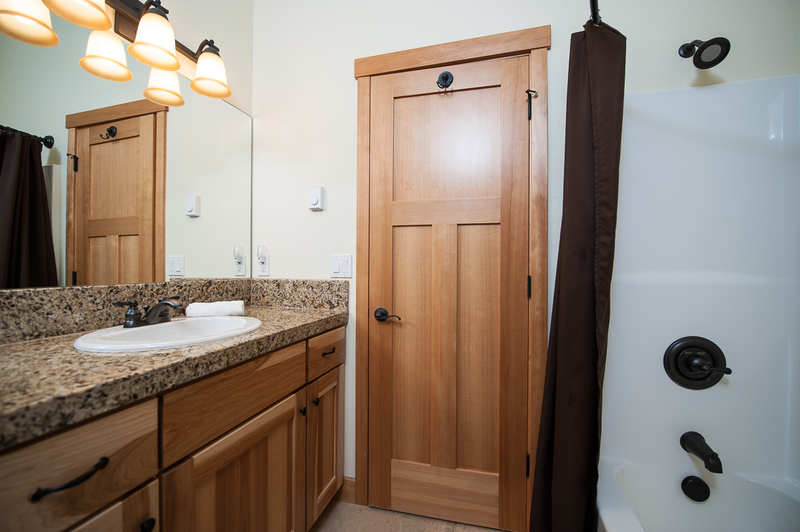 The master suite has a king bed, a door to the patio, and a private bath with a tub and shower combination. 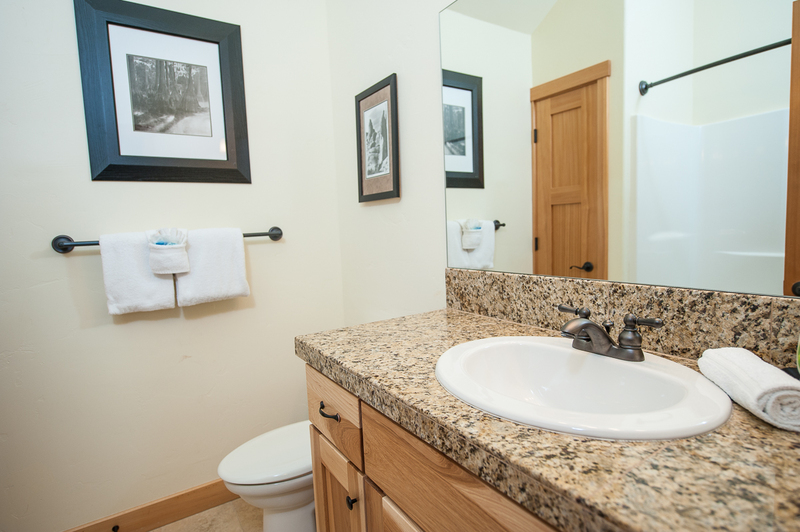 A powder room and the laundry room are also on the main level. 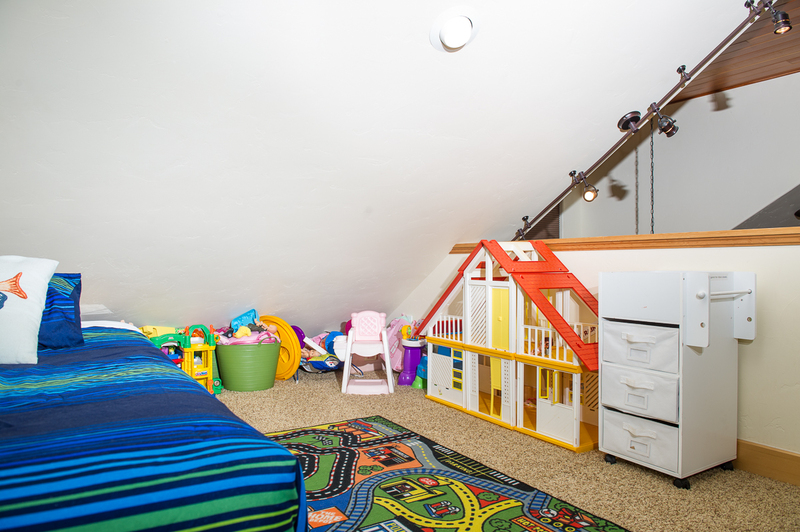 Upstairs is an open loft area perfect for the youngest vacationing guests; this play area is complete with toys, books, games, art supplies and more! It's a kid's dream, with a twin bed and a twin loft bed that is situated above two toddler size beds. There is also a pack and play crib for the tiniest vacationing guest. The guest room has a queen bed and the guest bath has a tub and shower combination. Take a walk through the short breezeway to the full guest suite, which is located above the garage. This guest suite has a mini kitchen with a full size fridge, dishwasher, microwave, sink and cabinets. Be sure to use the milkshake maker and popcorn popper! A private bath with a tub and shower combination is in the suite as well. The large open floor plan of the suite allows it to be used as a family room or a private sleeping bedroom. A large flat panel TV, a sleeper sofa, a gathering table and the lake view balcony makes this space perfect for all your vacation needs! The lake view deck has a BBQ grill and a table with chairs for four. Besides hundreds of satellite TV channels, the home also has Internet TV, a Blu-Ray player, a Wii gaming system, an iPod alarm/stereo docking station, Wi-Fi and free long distance calling, in case you need to do a bit of work! Other amenities include a second large capacity washer and dryer in the garage, a pedal boat, two adult and two child kayaks for the lake, and small kids' bicycles and scooters. * There's so much to do in the area, including fishing in Spring Lake, and beach access is less than two blocks from the home! Hear the surf at night, watch the sunset, and enjoy the fresh ocean air! 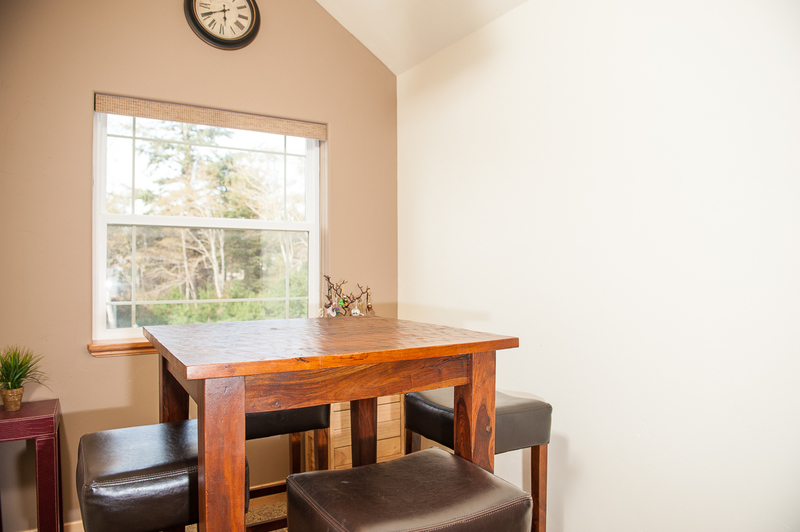 This home is truly family friendly, so come down to the Oregon coast today! "Hello Tara, Thank you for your review. We are glad to see that you had a great stay at Waterside Family Fun. We hope to have you back again soon." "Perfect for families with kids." "Hello Emil, Thank you for your review. We are glad to hear that you had a great stay at Waterside Family Fun! It's all in the name that this home is perfect for families, so we are glad that you found this to be the case! We hope to have you stay with us again soon on the Oregon coast!" "The vacation rental was great. Definitely clean and spacious. The upstairs loft is awesome, and the extra add-on loft with a kitchenette, bar, full bathroom and lounge area is great. It was a fun place to hang out after the kiddos went to sleep. Short walk to the beach, although the beach was quite windy so we didn't get to enjoy it as much. Only 15 mins away from the Tillamook Creamery which is a big draw!Would definitely recommend to others!" "Hello Judith, Thank you for your review. We are glad to hear that you enjoyed your stay at Waterside Family Fun! We are glad the home and location were accommodating to your needs! We hope this means we'll be seeing you back again soon on the Oregon coast!" "We used this home for Groomsmen preparing for a wedding on the beach. It could not have worked more perfectly. The number of bathrooms were excellent for seven guys getting ready for a wedding. It even had a perfect play area for the littlest member of the wedding party - he loved the bunk bed with the slide! Recommend better communication regarding keys/access to the unit initially; however, the management company was very responsive and helpful to get things squared away.Thank you! We hope to visit again!" "Hello Darbi, Thank you for your review. We are glad to hear that you had a great stay at Waterside Family Fun. We are happy to know that you were able to get everyone ready for the wedding easily while staying here. We are sorry to hear that you had trouble with getting into the unit. We always send an email out with this information before a stay. We are happy to know that our office staff was able to help get you into your rental though! We look forward to having you stay with us again in the future!" Private home on a lake! "The home is very well built with nice features and modern decor. We really enjoyed the personal watercraft. Life jackets are there as well as beach toys, kites, bikes, bike pump, etc. We also used the bbq on the back deck. The beach is a very short walk and has excellent views of the Twin Rocks. The location is easy to find." "Hello Joshua, Thank you for your review. We are glad to hear that you enjoyed your stay at Waterside Family Fun. We are glad that you were able to use some of the items provided by the owners during your trip. We hope to have you stay with us again in the future!" "The Frye vacation property was a pleasant, quiet location. We worked remotely via the Wi-Fi without any trouble and using PS4 had access to our Netflix / Amazon prime accounts in the main floor of the home.The kyaks and paddle boat were awesome on the hot days at the coast. The home was a nice walk away from the beach and not far from downtown Rockaway, Oregon. Located about 5 miles from Garibaldi, Oregon and 13 miles from Tillamook, Oregon. It is located near a cool tide pools area just to the south of the Rockaway house.The Rockaway / Garibaldi cove is a wonderful opportunity to kayak in a little larger body of water. A real cool adventure.Two items of improvement :The home has a guest apartment, a great place for the kids but doesn't have internet access. 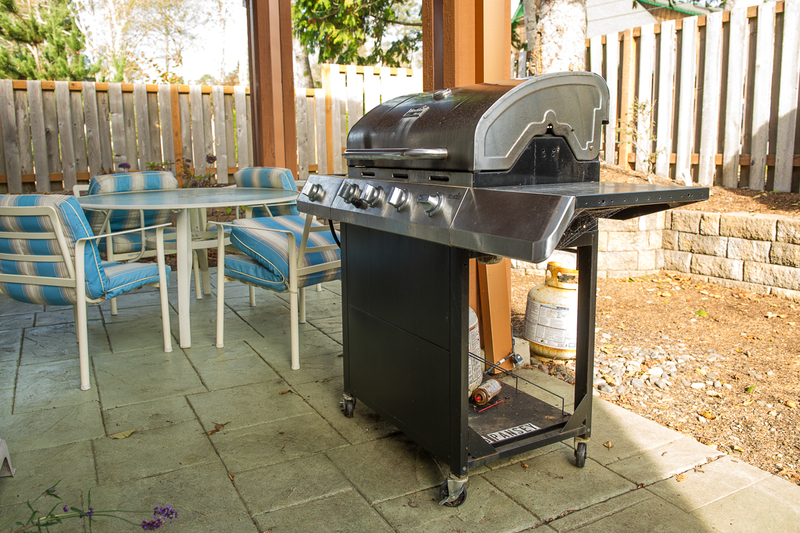 We also had a gas grill to use, but it needed some serious clean up, before we could use it. " "Mr. Fisher, thank you for your review. We appreciate hearing from our guest and hearing they enjoyed the property they chose to visit. This particular property is unique and a comfortable home giving one a welcome feeling from the moment you open the front door. The proximity to many enjoyable activities along the coast and the lake right there at your door. Hope you and your family made memories to last a lifetime and we hope to hear back to assist in the planning of your next coastal getaway. I will bring the bbq cleanliness to the manager who takes care of the property and let her know attention needs to be paid to the use of the bbq. Again, thank you Mr. Fisher and enjoy the remainder of the summer." 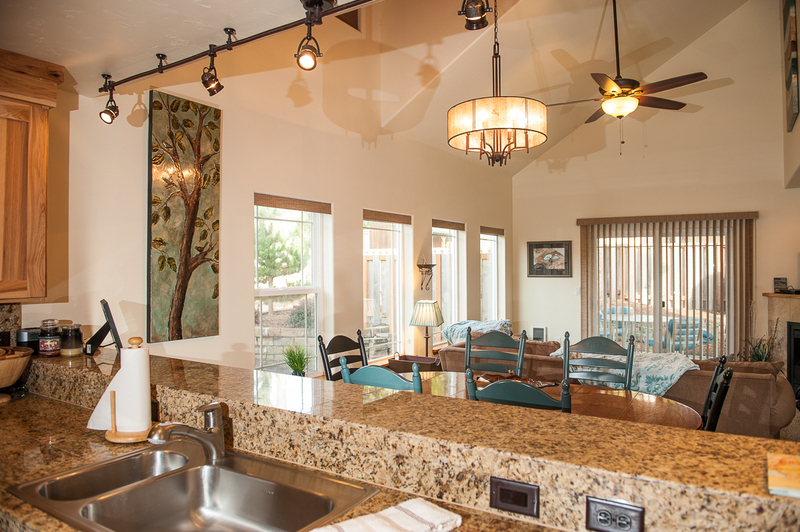 "This home was really nice, close to a 18 acre lake and they provided Kayaks and a paddle boat. The kids fished and kayaked. Just a short walk to the beach. The home had a nice Mother-In-Law suit or man cave over the garage with a couch hide-abed. The house could have used a better cleaning and we had a couple minor issues and concerns, but over all it was a really nice house, great location and we would definitively rent this home again in the future. " "Great location for our family reunion. House has some plumbing challenges - mostly shower draining and flushing of upstairs toilet"
"Hello Susan, Thank you for your review. We are glad to see that you enjoyed your stay at Waterside Family Fun! We are sorry to hear that the home had a few issues with plumbing. We will let our maintenance know. Thank you for bringing it to our attention, and we hope to see you back again soon on the Oregon coast for another wonderful getaway. Thank you again for your review." "Enjoyed this rental - very spacious and perfect location. Couple of small items: Main Bath tub had drainage issues and the lake toys in the rental description "Other amenities include a second large capacity washer and dryer in the garage, a pedal boat, two adult and two child kayaks for the lake, and small kids' bicycles and scooters" were not accessible. When I called - the property management said those were no longer available. Would have liked to be told this in advance as this was part of the reason we rented the unit. FYI the property listing still shows the toys are accessible. " "Hello Susan, Thank you for your review. We are glad to know that you enjoyed your overall stay at Waterside Family Fun. We are unsure as to why you were told that the extra amenities were no longer available. As far as we can tell, these items are still available for guest use. We are sorry for the inconvenience. We hope to have you stay with us again in the future. Thank you again for your review." 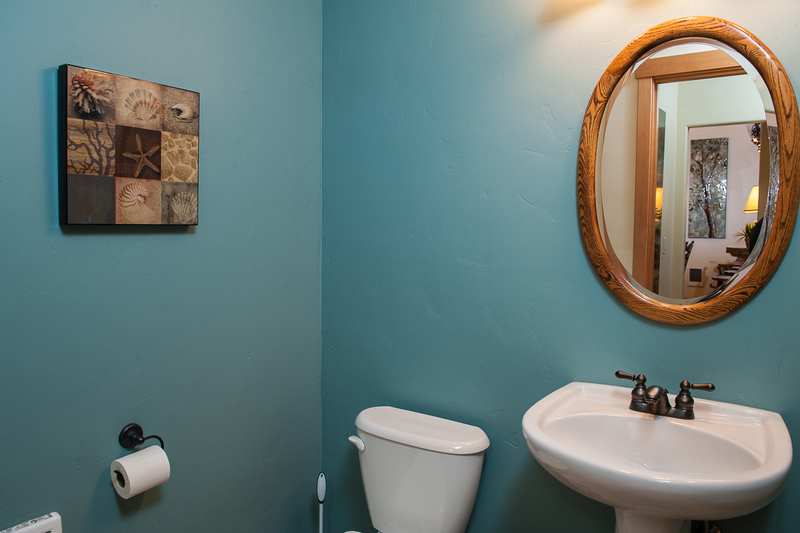 "The only thing that we had issues with them was the upstairs toilet was so dirty it was no lien filthy looks like it had been cleaned in years.The other thing is the kitchen could be stocked with a few more better pots and pans"
"Hello Randy, Thank you for your review. We are glad to see that you enjoyed your overall stay at Waterside Family Fun. We are sorry to hear that the kitchen did not have the kind of pots and pans you were expecting. We are looking into this. As for the toilet issue, it sounds like it might simply be stained. We have not received any other complaints about this being a problem. We hope to have you back again soon." "Location was great. The beds needs some work and the overall house needs some clutter removal. The house is great for families with small children "
"Hello Anita, Thank you for your review. We are glad to hear that you enjoyed your overall stay at Waterside Family Fun. We are sorry to hear that you did not find the beds comfortable. If this is a common concern among guests, we will bring it to the owner's attention. We hope to have you back again soon!"